The 2015 Miss San Pedro Pageant is only days away and the six lovely contestants are making final preparations for the big show. But prior to the pageant, Brianna Hope Leslie, Vivian Noralez, Ethel Villatoro, Tisane Martines, Iris Salguero and Velie Alexi Williams have been kept quite busy, as they have participated in several events and outings. The contestants’ journey to the Miss San Pedro Pageant kicked off on Tuesday, July 21st with their first social outing. The girls had the opportunity to interact and meet each other during an overnight stay at Grand Colony Island Villas. This was also the site of their first official photoshoot. The pictures of this shoot where used to introduce the contestants to the island community leading up to the Sashing Ceremony on Thursday, August 30th. This event is a tradition to the pageant where the contestants get to opportunity to officially meet and socialize with their sponsors. Here is where they get their official sponsor sashes for the pageant. 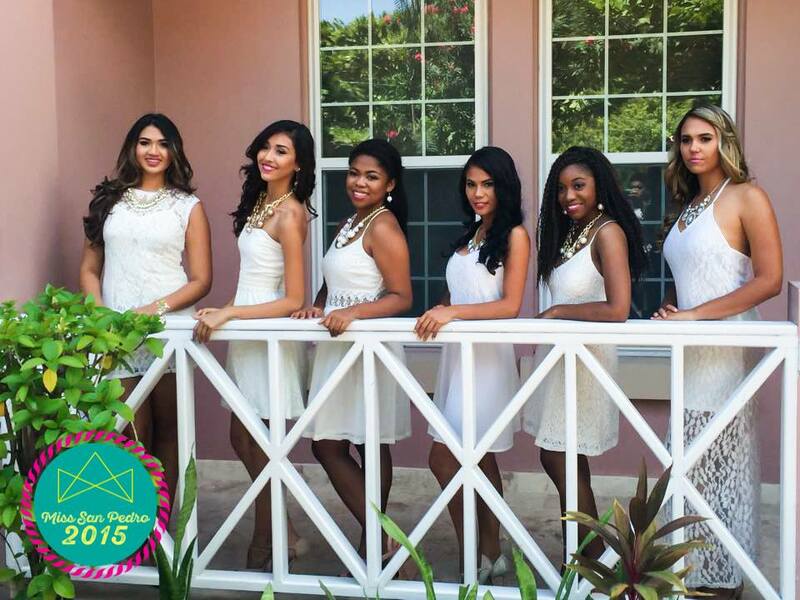 In the following weeks after their official sashing the six lovely contestants participated in another photoshoot, this time at El Secreto Resort on Saturday, August 1st. They we treaded to an overnight stay with dinner and breakfast. The contestants were also delighted with a trip to Hol Chan Marine Reserve and Shark Ray Alley on Wednesday, August 5th, compliments of The Belize Pro Dive Center. The Amigos del Mar Dive Center hosted the girls to a full experience of the Blue Hole on Sunday, August 9th, including breakfast at the Amigos del Mar dock, snorkeling, and lunch at Half Moon Caye. 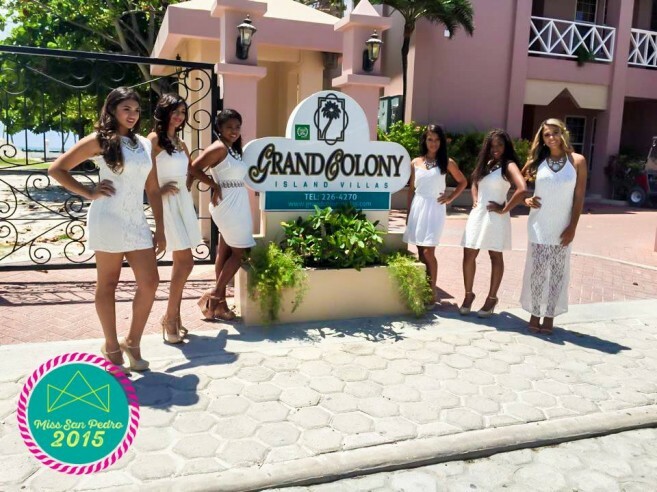 But the highlight of the road to the pageant had to be the contestants visit to Chetumal, Quintana Roo from Friday, August 14th to Sunday, August 16th. Every year, the Miss San Pedro delegates have the opportunity to travel to Chetumal as a social outing and through San Pedro Town Council’s alliance with The Hotel Los Cocos and Chetumal, The Linda San Pedrana title was created. Linda San Pedrana is a title given by The Hotel Los Cocos staff to one of the contestants vying for the crown of Miss San Pedro. The title is awarded to the contestant that the staff feels is the most deserving of the crown, and shows qualities like friendliness, politeness, elegance, grace and spirit. The first ever Linda San Pedrana title was given in 2014 to reigning Miss San Pedro Muchelle Nuñez. This year Hotel Los Cocos wanted to elaborate on the title by making a small public performance on Saturday, August 15th. The ladies vying for the title had to present themselves in front of a panel of judges, hand selected by the Hotel Los Cocos. The presentation included a short dance of La Isla Bonita and a small introduction where each of the girls invited the crowd to come enjoy Belize’s luxuries. This was followed by a fashion show of casual wear, swimwear and evening wear. At the end of the night the judges made their decision and presented their votes in a closed envelope. This envelope will be not be opened until the pageant night when the new Linda San Pedrana will be sashed. It is important to note that this title has no influence on the judging system for the actual Miss San Pedro Pageant. The title of Linda San Pedrana is simply a symbol of gratitude and friendship between the people of Chetumal and San Pedro. The Miss San Pedro Pageant is scheduled for Saturday, August 29th at the Honorable Louis Sylvester Sporting Arena. The gates open at 6PM for seating and show starts at 8PM sharp. Ticket prices are: reserved at $25, general at $15 and children at $5. Reserved tickets are exclusively sold at the San Pedro Town Council office. Everyone is asked to mark their calendar as this is a show you don’t want to miss!